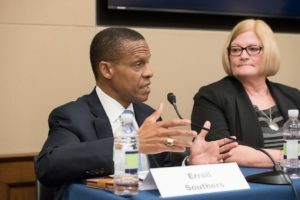 Dr. Erroll Southers, TAL Global’s Managing Director for Counter Terrorism and Infrastructure Protection, was an invited expert panelist last week in Washington D.C. at a school security event hosted by the Security Industry Association (SIA), a trade association for electronic and physical security solution providers, in cooperation with the Congressional School Safety Caucus on Capitol Hill. The forum, held on March 2nd, 2016, brought together the co-chairs of the caucus, Reps. Rick Larsen (D-WA)., and Susan Brooks (R-IN), with private- and public-sector experts to assess strategy for securing our nation’s schools. Robin Lambert, Rural School and Community Trust. Reps. Larsen and Brooks emphasized their support for the School Safety Act (H.R. 2667), which would revive federal assistance to help schools implement security measures. The panel discussed, among other topics, best practices offered by the Partner Alliance for Safer Schools (PASS), designed to improve security by tiers, depending upon threat levels and resources. (For more information on PASS, visit http://www.passk12.org). Click Here to read more about the School Safety Event. Next PostTAL Global Welcomes Rams to Inglewood!